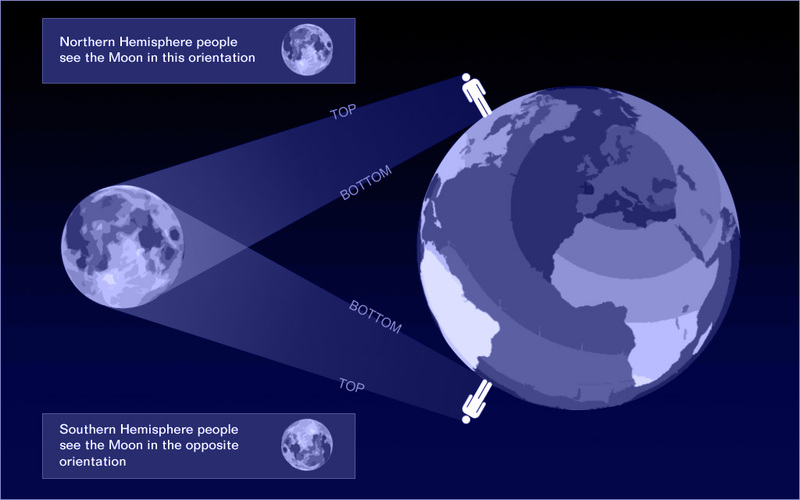 1) The moon appears upside down in one hemisphere as compared with the other. 2) In the Northern Hemisphere the sunlit part of the moon appears to move from right to left. In the Southern Hemisphere the sunlit part appears to move from the left to the right. If Earth is flat, how is this possible? Flat-earthers have no answer. In fact, you can stand near the equator in some location such as in the Central American nation of Ecuador, and look north to view the stars rotating counter-clockwise, and then you can turn around and look south to view the stars rotating clockwise. There is a website dedicated to this phenomenon. Here is the address: http://sguisard.astrosurf.com/Pagim/...e_to_pole.html Check it out yourself! 3) In the Northern Hemisphere, the stars appear to rotate counter-clockwise around the area of the North Star, Polaris. 4) In the Southern Hemisphere, the stars appear to rotate clockwise. 5) In the northern hemisphere, the moon rises and sets from left to right. But in the southern hemisphere, the moon rises and sets from right to left. None of this is explainable on a flat earth, but if the earth is a globe, it all makes perfect sense. But wait, there's more! More questions flatties avoid answering, such as: If the earth is flat, what is the approximate length of the Arctic Circle and what is the approximate length of the Antarctic Circle? Watch Dave avoid this like the plague. Last edited by User Name; February 11th, 2018 at 02:08 PM. My purpose in starting this separate thread was to put all of the proof for a globe in the opening post, so everyone can read it when they click on the thread. If you have any other proofs you want to add, post them here! Here's the first proof that you can't answer. I know that nobody has ever circumnavigated the globe going south. Using the globe model, If you start at the north pole and go south to the alleged south pole, once you pass the fake pole you will not start going north again. You can't go from the top of the globe to the bottom of the globe and then back up the OTHER SIDE. A true circumnavigation, a complete circle around the ball. Nobody can do it no matter what transportation mode they use. Not a plane, a jet, a rocket, a nuclear submarine with endless fuel nor a balloon etc. I propose that if you start going south from any point on the globe/ball you will never come back up the other side because we're not on a globe. Instead, what will happen is that you never find the end and/or the "southernmost" point. The fake south pole is simply halfway around the fake globe according to the fake measurements of earth. Last edited by Sherman; February 23rd, 2018 at 01:52 PM. Reason: Removed the unnecessary formatting. You will start getting infractions for this if you don't stop it. Here's the first proof that you can't answer. I know that nobody has ever circumnavigated the globe going south. How do you know that? Have you ever tried it? You could try but you won't because you are part of the Illuminaty plan to hide the biblical truth of an oblate spheroidal earth, all for the sake of mammon. Diversion tactics, and irrelevant, because the proof is in the OP. You will notice that no flatty has addressed that proof. I will. Dave can too. Wiz only does drive by's, he can't prove anything. What are you saying BR, do you think the God describes a moving, flying, spinning ball streaking through the firmament at hundreds of millions of mph? Or are you offering scripture to disprove the globe concept? I have a thread called Biblical Enclosed Flat Earth and Firmament specifically for scriptures. Check it out sometime. Yes, that's a good scripture, among many from Genesis, Isaiah, Job and many other books and verses that describe the enclosed flat earth and firmament. Last edited by User Name; February 11th, 2018 at 02:10 PM. Yeah, cuz you don't do that my threads. You can prove it yourself. So far, you seem unwilling to do so. I am going to. If I can do it I'm going to address every example in the OP point by point and destroy them. When I have the time. It's not my top priority right now. We already had 3 threads dealing with flat earth to begin with, now four. Keep in mind I'm the only guy here most times defending the flat earth possibility. It's 10 against 2. Have some mercy on us. I am going to. If I can do it I'm going to address every example in the OP point by point and destroy them. Now, if the earth is as flat as a pizza and the South Pole is its outer crust, how can the sun shine on it 24-7 for 4 months straight?